Domini Kemp is a bit of a powerhouse, not only is she the co-owner of the itsa chain, Hatch & Sons, Alchemy Juices & Joe's Coffee Shop with her sister Peaches, she trained as a chef in Leiths in London, has already written two cookery books, broadcasts on food on RTE Radio 1 and has a weekly cookery column in the Irish Times. Column is a bit of an understatement actually, it's a double page full colour spread. If you want something done, ask a busy lady (obviously). 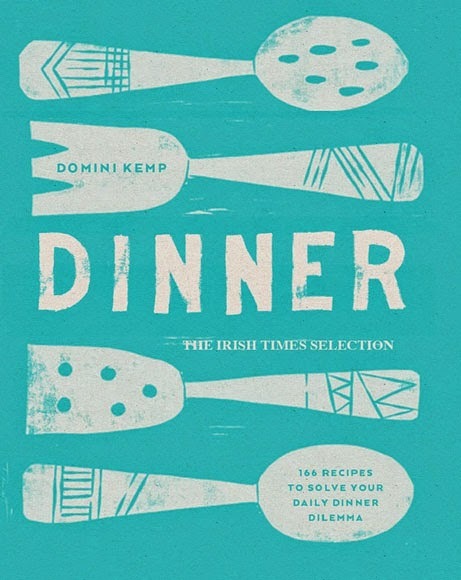 Dinner is a collection of Domini's most popular dinner recipes since she began writing the column in 2008 and it is a powerhouse of a book. When I opened it in the office, it was snatched out of my hands by the ladies in design. They love a beautifully bound and well illustrated book and Dinner ticked all of the boxes for them. It's another Graham Thew masterpiece and so simply laid out but being very beautiful at the same time. If you've ever wondered what to cook for dinner (which is how this little website came about), then Dinner is a perfect compendium of recipes. It covers poultry, meat, fish, vegetarian, pizza, pasta and sides so nobody will ever go hungry. Some of my favourites are lamb with capers, parsley & anchovies (p. 94), pork larb (p. 130) which is very like my own Asian Minced Pork and garlic roasted new potato salad (p. 288). If you want a book that covers quick and easy suppers to more elegant entertaining dishes, then buying a copy of Dinner is possibly one of the shrewdest moves that you'll make this year. Domini Kemp solves the perennial question in our house. "What's for dinner?" This is a great book, packed with no-nonsense, quick, easy and, most importantly, delicious dinners. A great present for someone who's fallen out of love with cooking things from scratch.